Why do we have the ongoing debate over whether the toilet paper roll goes “over” or “under”? Now that we’ve addressed the issue of replacing the toilet paper roll, it’s time to talk details and get nitpicky. 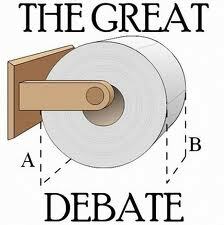 When it comes to how the toilet paper roll should go on the holder, people are as divided on toilet paper orientation as they are on presidential politics. Even my boyfriend and I are split on the matter, he being an “over-believer” while I’m an “under-believer.” Our deliberations have been rather civil to date, but I’m hoping they won’t escalate to the point where we’ll need bathrooms that are strictly his and hers. At what point did we all get so passionate about the “over-under” matter? Those on both sides of the tissue make good arguments in support of their positions. The over-believers feel their position is the right one because their way is the way of the hotels, the way in which the flapping sheet can be folded daintily, and the way that displays any decorative imprints on the paper clearly. The under-believers, however, see that their position is the right one because the toilet paper is easier to tear with one hand, it’s neater looking, and it’s harder for cats and kids to unroll. Since I am by no means an expert on the subject of toilet paper etiquette, I thought it helpful and wise to consult experts on the subject. According to The International Center for Bathroom Etiquette, the proper way of hanging the roll is whichever way your wife wants to hang it, but if you don’t have a wife then it’s up to you to decide which way to hang it until you get a wife or someone else to impress. Emily Post’s Etiquette Daily asserts that toilet paper orientation is a matter of preference rather than one of etiquette, so hang your toilet paper roll any darn way that pleases you. As for my boyfriend and myself, we’ve reached a truce on the issue: whoever replaces the roll of toilet paper is the one who determines which way that particular roll will hang (I guess this means I’ll be changing a lot of rolls). 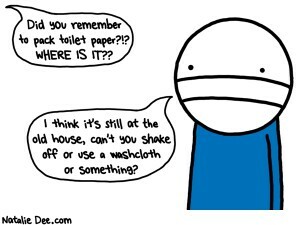 After all, why should there be a fuss over something as inconsequential as toilet paper? Why is it that nobody wants to be the one to change the roll of toilet paper? Ever since we moved away from the days of using leaves, twigs, and newspapers for personal hygiene, a battle has been continuing in bathrooms across the land over who will be the favored one to put out the new toilet paper roll. For whatever reason, no one wants to be the TP designate. At all costs we avoid going through the trouble of taking the empty cardboard roll off the holder and replacing it with a new roll full of cottony softness to pamper our backsides. It does entail a bit of effort–taking off the old roll, disposing the old roll, obtaining the new roll from wherever the rolls are stored, putting the new roll on, and unraveling the first sheets of paper from the roll. This is a far too time consuming and complicated process with too many steps for some. Many (more) steps are taken, however, to avoid replacing the roll. The first step is to use less paper to make sure it doesn’t run out during your turn in the loo, but this can cause the problem of not getting “the job” done as well as it should. The next step is to use another bathroom (if there is one) that has more paper on the roll, but the problem with this is that the second bathroom will eventually run out of paper, thus causing multiple bathrooms to be in need of new rolls simultaneously. If there are tissues in the bathroom, they can be used as a temporary replacement, but they too will run out sooner or later bringing us back to the original issue of changing the roll. My favorite step is to make sure there’s at least one sheet left on the roll, because as long as there is that one, solitary, lonely sheet, you are not the person held accountable for changing the roll. Use up that very last sheet, and it’s your obligation to put out a new roll. Of course, if you live with someone, you can always call out from “the office” and ask them to deliver more paperwork to you, but if the answer you get is “use your fingers,” then you’re out of luck. Why can’t we (including yours truly) just avoid all the hassle and use a little foresight when we have our dealings with Mother Nature? Why is it so difficult for many of us to “unplug”? Everywhere you go nowadays, people are texting on their cell phones, checking the Internet on their smartphones, or writing e-mails on their tablets. We’re so plugged into our electronic devices that it seems like we’re more virtually connected to each other than we actually are in the flesh, face-to-face. For some, the idea of spending a weekend or even one day unplugged can cause symptoms akin to a panic attack. Like a caffeine addict looking forward to the morning’s first cup of coffee, the anticipation of receiving an e-mail or a text does something to us and to our brains. We need that information high, that high of being in the know rather than in the now. I even tease my boyfriend that he can’t stay away from his smartphone for too long since he’s often checking it when we’re together (in his defense, he’s getting better about it). We’ve gotten so used to the electronics and the distractions that our hyperactive, multitasking selves wouldn’t know what to do in the absence of all the technology that regularly surrounds us. Throw us in a field in the middle of nowhere with nothing but the sound of the breeze and the sight of tall grasses swaying and we’d probably be itching to check our e-mails. It appears that we’ve forgotten what it’s like to live in the moment, to appreciate the simple things around us, to enjoy the actual company of others as opposed to the virtual. According to some neuroscientists who used themselves as subjects, it can take several days or longer to let your mind decompress from overstimulation, but the benefits can be great: better cognitive function, less stress, and contentment. 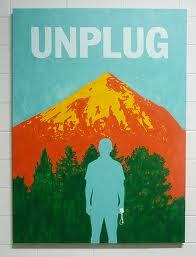 If unplugging every so now and then is so beneficial, why aren’t more of us doing it?